A Digital Dashboard is an electronic interface that aggregates and visualizes data from multiple sources, such as databases, locally hosted files, and web services. Dashboards allow you to monitor your business performance by displaying historical trends, actionable data, and real-time information. Digital dashboard: an information management tool that is used to track KPIs, metrics, and other key data points relevant to a business, department, or specific process. Through the use of data visualizations, dashboards simplify complex data sets to provide users with at a glance awareness of current performance. How does digital dashboard software work? Everyone in the business, regardless of their role, has questions about how your company is performing. How is our campaign performing on social media? What is our churn rate today? How many customers are waiting on a reply from our sales reps? Digital dashboards and compelling data visualizations allow you to answer these quickly. The final product, like the image above, takes time to design. An effective dashboard is built upon a solid foundation of good data; a compelling dashboard design distills large volumes of data into concise, meaningful, and actionable visualizations. To begin the journey to an effective dashboard, you must first know what business questions you are trying to answer. For example, you may want to be answering the overall question, “How has my latest Google Adwords been performing?” This question, in turn, prompts other questions such as, “Am I spending too much on Adwords?”, “Have the ads been driving traffic to my website?”, and “Is the campaign driving lead conversions?” Once you have a definitive question or questions that you are aiming to answer, you can move on to finding where the relevant data is stored. Where does digital dashboard data come from? Visualizations can take many different forms, and it is important to know which one to use for which data set. In keeping with the example, if you were to try to answer “Am I spending too much on Adwords?” you may want to use a gauge metric. The gauge metric allows you to depict different spending ranges for which spending is either optimal, acceptable, or in need of re-evaluation, as well as setting a target spending value. Finally, it’s time to share your dashboard with the right people. Who will find your dashboard useful and actionable? With a dashboard focused on Google Adwords performance, the dashboard would not be effective for anyone on your development team, as they cannot do any work to directly affect your data, nor would it be suitable for your executive team, as they are incredibly busy with other priorities and would only have time to examine one metric that summarizes total ad spending. You would, though, want to share the dashboard with your marketing team (through wallboards, desktop, mobile, etc. ), giving the relevant people the ability to answer their questions and monitor digital marketing KPIs. How do businesses use digital dashboards? "Why is our canel rate increasing and how can we keep it stable?" This question can be answered with a metric such as Monthly Account Retention Rate. The Landing Page Traffic by Source/Medium metric gives you insight into what source is driving traffic to your landing pages. Facebook Ads can drive highly qualified leads to your website. The Facebook Campaign Performance metric answers your Facebook Ads performance questions. Organizations are often seeking a way to simplify data analysis and distribution. Anyone who wants to save time, gain control of their processes and performance, and avoid data overload turns to dashboards. Marketing teams use them to keep track of their campaigns and conversion rates, sales teams use them to stay on top of opportunities, and executive teams and SaaS companies use them to have a continuous overview of their organization’s stats. Marketing is a blend of art and science. Marketers need to consistently design ads, launch campaigns, and grab the attention of their target audience. They also need to monitor what campaigns are bringing in the most leads, which ones are underperforming, if they are meeting their goals for the week, month, quarter, etc. Digital dashboards give your marketing team the ability to seamlessly monitor and measure their performance metrics. These marketing dashboard examples show you the many different ways in which your marketing team can utilize dashboards. It is crucial for Sales teams to be up to speed on the latest opportunities and challenges. Having a sales dashboard displayed keeps your sales reps focused on what the most pressing tasks are, and what actions need to be taken immediately. Here are some sales dashboard examples that demonstrate the ways in which sales professionals use dashboards to stay on top of their metrics. Business executives don’t have a lot of time to spend manually gathering and summarizing data. Dashboards summarize and present complex information in easy-to-read and actionable ways. These executive dashboard examples show what metrics should be put on a dashboard and their functionality for executives. It is important for SaaS (software as a service) businesses to stay on top of metrics such as recurring revenue, churn rates, customer retention, and net burn rate. Comprehensive dashboards are crucial for these businesses as they allow them to monitor these metrics at the same time as they monitor the other typical metrics any other business needs to monitor. 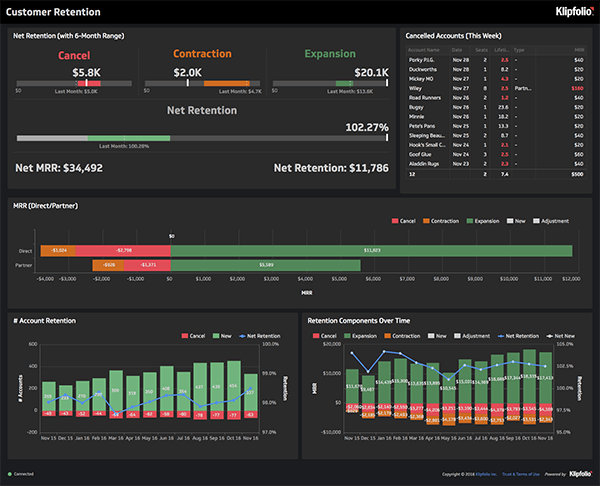 The SaaS dashboard examples shown here give insight into the dashboards that these businesses use. What types of KPIs and metrics are tracked using digital dashboards? The most effective dashboards use visualizations that are monitored in real-time and day-to-day, are actionable, and answer the question “what’s happening now.”They should have obvious, meaningful takeaways that make an impression with just a glance. Social Events - Monitors key events on each of your social channels such as likes, reposts, and mentions, and assigns them a weight according to their significance. Learn more about metrics for your businesses social media dashboard. Sales Target - Measures the number of wins over a specific time period and compares it to a target value and past performance to motivate your sales team. Customer Retention Rate - Measures the rate at which a subscription based company holds on to its customers. The compliment of 'Retention Rate' is 'Attrition' or 'Churn Rate'. Pingdom Last Error Metric - Easily tracks and displays the time since your last Pingdom error. Ticket Queue - Analyzes tickets in queue to prioritize urgent issues, and coordinates a response that will resolve customer issues in a timely manner. Analytical dashboards focus on accumulating insights for data over time – often the past month or quarter. These insights are then used to understand what happened, why it happened, and what changes can and should be made to positively affect these in the future. Analytical dashboards primarily use what-if analysis and pivots to identify patterns and opportunities, and help align business goals with performance management initiatives. For example, let’s say that an organization wants to compare trends over time or identify why certain products are performing better in one region than another, that organization would build and refer to a digital analytics dashboard. Similarly, and company wanting to examine the success of marketing campaigns by combining sales data with product placement and marketing campaign strategy to determine the success of individual campaigns and areas for improvement would do the same. In short, analytical dashboards are meant to help an organization establish targets based on insights into historical data. Operational dashboards focus on managing day-to-day business processes, giving continual view into what is happening within the business unit – frequently changing and current performance metrics or key performance indicators (KPIs). While these types of dashboards are most common in business environments where it is critical to act on any opportunities and issues as quickly as possible (sales, marketing, help-desk, supply-chain, etc. ), operational dashboards are applicable in almost every department and are often used organization wide. Similar to analytical dashboards, these dashboards can also help to identify recurring trends over time and provide context around KPIs, the visibility they provide into current, actionable data separates them from a solely analytics-based dashboard. In short, operational dashboards are meant to help an organization understand if it’s performance is on or off target, and by how much, in real time. Strategic or executive dashboards focus on providing the KPIs that business executives need to monitor on a daily, weekly, or monthly basis. These dashboards should display high-level summaries of the most important and relevant data on the overall progress of the business, as well as where realistic goals may be set in the future. To choose the best dashboard for any given business problem, the first step is to ask some questions. The answers to these questions will not only guide you to the types of business metrics to build and measure, but can also help determine the type of dashboard to deploy. Business Question: What Problem are we trying to solve? Implications: Identify what is driving the need for a dashboard solution and to define the scope of the project. Analytical or Operational:Trends or deeper insights - analytical. KPI awareness or time sensitive - operational. Business Question: Who will be using the dashboards? Implications: Design, features, and required training will change based on the role of the dashboard user. Analytical or Operational: Executives or analysts - analytical. Line of business (LOB) managers, general workforce - operational. Business Question: What gaps exist in our performance? Implications: The identification of gaps can be used to develop a set of metrics that will be used as the basis for the development of the dashboard. Analytical or Operational: Performance issues - both. If it is daily performance - operational. Business Question: What are our goals? Implications: Before developing metrics, it becomes important to identify what you hope to achieve by using dashboards as well as align those goals to the department’s or company’s overall strategy. Analytical or Operational: Strategic and analytical goals - analytical. Are employees aware and tracking against goals - operational. Technical Question: What is the state of our data infrastructure? Implications: Organizations with strong and broad data warehousing and BI infrastructures may choose to leverage existing data, by better exposing both operational and analytical intelligence. Analytical or Operational: Broad and clean infrastructure - both. Discrete operational or transactional-based solutions - operational. Technical Question: What are the data latency requirements? Implications: The currency of the required information helps define the dashboard. Organizations requiring frequent updates will most likely look at operational dashboards. Analytical or Operational: Low latency, time sensitive, and real-time - operational. Technical Question: Where does the data reside? How many data sources are you looking at using? Implications: Not all dashboards are created equal. Some dashboards only support one data source per visualization, while others (such as Klipfolio) allow users to combine various data sources to enable broader and deeper understanding. Analytical or Operational: Multiple data sources within a single dashboard or set of visualizations - analytical. Improve visibility of individual systems and applications (one data source) - operational.